This villa has been converted into luxury hotel accommodation in recent years. Tavarnelle Val di Pesa is of ancient origin but the current town is quite modern in appearance and in fact acquired such importance as it has in relatively recent times. It takes its name from its location in the valley of the river Pesa. Within Tavarnelle itself, the Church of Santa Lucia al Borghetto is the most interesting architectural sight, being a rare example of Tuscan Gothic architecture. Nearby there are several extremely interesting structures, notably the parish church of San Donato in Poggio, the parish church of San Pietro in Bossolo which now houses the Museum of Religious Art of Tavarnelle, and the large and important monastery of Badia a Passignano. Details below. 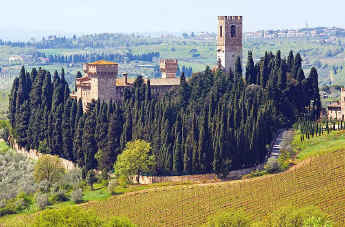 Don't forget to visit nearby Barberino Val d'Elsa ! The first mention of the town of Tavarnelle dates back to a map of the year 780, with the name Tabernulae, possibly referring to the taverns located here on the road from Florence to Siena, but a much older origin is likely. In the square in front of the Church of S. Pietro in Bossolo, previously S. Petrus in Pixide and built towards the middle of the eleventh century, ruins have been found that are thought to belong to a church built in the fourth century, and tombstone belonging to the tomb of Almemanna, spouse of Flavius Faustinanus, has been found, dating back to 424. The Val di Pesa, as well as the neighbouring Val d'Elsa, was already densely populated in the eight and seventh centuries BC, and quite important Etruscan settlements have been discovered in the area. The town of Tavarnelle then developed with the union of three mediaeval hamlets: Tavarnelle, Borghetto and Mocale, located on crossroads between Florence and the mediaeval Via Francigena road in Val d'Elsa, later known as Strada Romana, from Rome to beyond the Alps. Although mediaeval traces of the town are unfortunately lost, Tavarnelle's importance is also confirmed by the building, in the first half of the 13 C, of the Franciscan Convent of the Borghetto. The village of Sambuca, too, was very important and strategic - at the intersection of the road from Florence to Sienna and the one from Val di Greve towards Val d'Elsa - and the settlements of San Donato in Poggio, one of the principal fortified settlements in the area, and of remarkable importance because it was located on the most direct route from the Strada Romana to the one between Florence and Sienna. 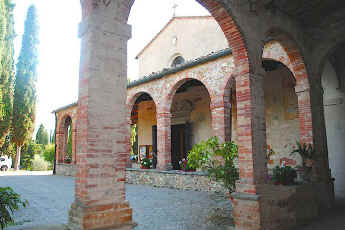 The Church of Santa Maria del Carmine has a simple layout with a single atrium consisting of a rectangular choir terminated by an apse in the style typical of the smaller religious buildings of the Gothic period. It is surrounded on two sides by a portico where there are traces of frescoes depicting St. Dominic and the Trinity attributed to Filippo Antonio Filippelli and Stories of Mount Carmel by an unidentified artist. The interior was renovated in the 17 C and then again in the early 20 C in neo-Gothic style. Originally, the entire interior must have been painted, but today there are only a few traces including, on the right, an Apostles and Adoration of the Shepherds, by an unknown painter strongly influenced by Filippo Lippi, while on the left the Apostles and Annunciation recently considered to be by Giovanni da Piamonte. The first altar on the right houses a painting of Christ in Glory and Saints, dated 1643 and signed by Nanno di San Gimignano, and in the second altar on the right, has another painting by the same artists depicting Saints Rocco, Sebastian and Peter Martyr. A glazed terracotta lunette containing an Annunciation dating from the 15 C and attributed to Andrea della Robbia was originally placed above the outer gate. From the porch you enter the cloistered Carmelite convent, located around a beautiful 16 C cloister with arches supported on stone columns and Ionic capitals. Under the portico there are frescoes of the Life of St. Teresa of Avila dating from in 1637. 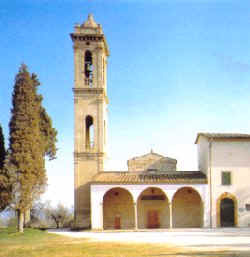 The church used to contain a large collection of works of art, including a series created for the Sernigi by Neri di Bicci. These are now located in the Museum of Sacred Art. 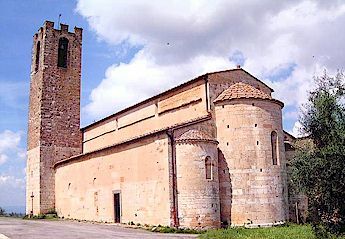 The Pieve di San Donato in Poggio (Parish Church of San Donato) is mentioned in a document of 989, with a castle erected in 1033 on the hilltop between Val di Pesa and Val d'Elsa. The geographically strategic position determined the building of walled settlements to control roads and possessions on the easy-to-defend hilltops; whereas villages open to travellers and commerce arose on the level ridges near crossing points at rivers and main roads. Following the reconstruction of the ancient bridge of Romigliano sulla Pesa near Sambuca in 1415, commerce increased notably. In 1898 Tavarnelle became a municipality, aggregating the parishes of Sambuca and San Donato in Poggio (which had previously been governed by Barberino Val d'Elsa). The name of San Pietro in Bossolo originates in the ancient toponymy S. Petrus in Pixide from the name pixulus or buxula, a chest used by the ancient Romans to store state revenues. The name therefore indicated the administrative centre of a territory. The church, situated at the southern watershed of the Pesa and Elsa rivers, was one of the oldest and most renowned parish churches within the Florentine diocese, the first part of the region, after Florence itself, to adopt Christianity. 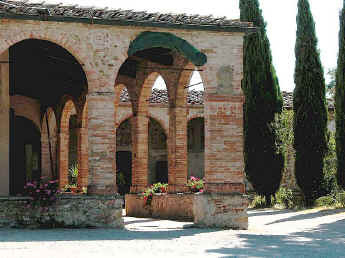 The nearby Vallombrosan monastery of Badia di Passignano is great architectural, religious and historical interest. The monastery and its surroundings are very photogenic but unfortunately the interior can be visited only on one day per month. 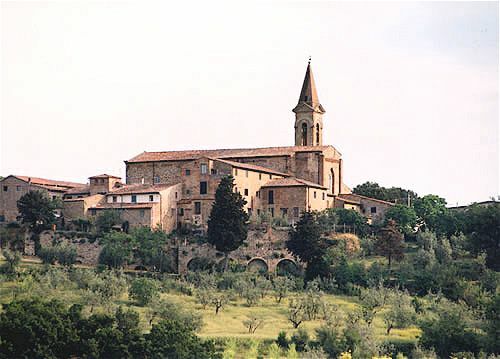 More about the Badia di Passignano. For your country accommodations in the Chianti Classico wine zone near Tavarnelle - stay in the cool Chianti hills - farm house apartments with pool. 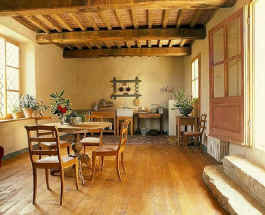 Check our Greve in Chianti Tuscany vacation rentals holiday rentals. 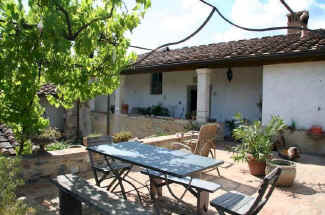 Click here for vacation rental apartments near Tavarnelle Val di Pesa. Pubblicizza qui la tua attivit� e vedi ora i risultati! Vorresti pubblicizzare la tua attivit� su questo sito web per Tavarnelle e ricevere traffico in entrata dalla nostra rete di pi� di 50 portali relativi? Clicca qui per ulteriori dettagli in merito alla nostra soluzione integrata per una presenza su internet piena di successi. Copyright � ammonet InfoTech 1998 - 2016. All rights reserved.